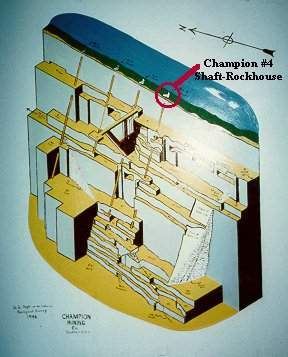 Inside Champion #4 Shaft Rockhouse, Continued.. Standing on top of the Copper Rock bins below location B looking up at one of the two massive sheave's in the sheavehouse at the top. At this point you are on a catwalk 30 or so feet above the rock processing floor (location C). After this shot I moved out on the catwalk to a ladder than disappeared into the sheavehouse another 30 feet or so above the catwalk. I was not feeling too brave at this time, it looks a lot easier from the outside, up a ladder, over a catwalk, it was a long way down if the ladder rung gave way. You only live once and what a view at the top. The head sheaves at the top of the Rockhouse. 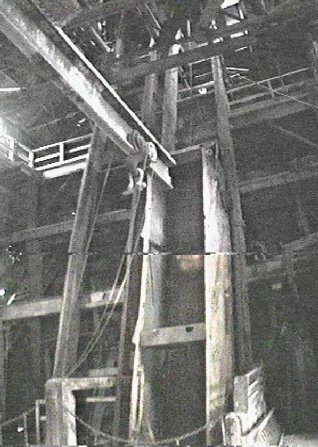 A great view from here of the hoist house and it is easy to see from here the route of the old hoisting ropes, as well as the foundation of the first hoist house, just northeast of the present one. I was told that the ropes from the old hoist house ran right across the ground and you really had to watch yourself when you were near. When you are visiting #4 look under the Batter Brace and you will see the concrete remains of the guide supports for the sheaves that changed the direction of the rope to climb up to the top of the Rockhouse. 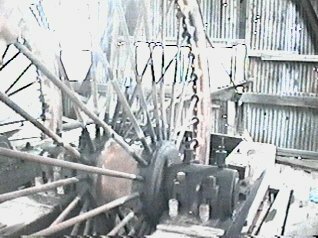 Another view of the sheave showing the bearings and wood brace. Lots of light up here, but watch your step, 120 feet or so to the ground from here. This image is made up of two video clips and was taken at location E at the bottom of the skip road. 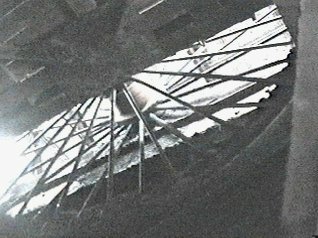 The image of the hanging skip was taken from the level with the railing, behind the skiproad. This level is reached from the Shafthouse by one set of stairs that are more similar to a diving board with a couple of missing stairs to make things interesting. At this level you are just above the storage bins and this is the main operating level of the Rockhouse behind. I hope you have enjoyed these images as much as I did filming and creating them. 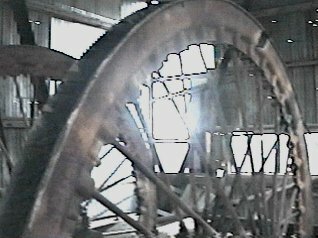 And I hope you will contribute to Painesdale Mine and Shaft, Inc. to help them continue the restoration effort so everyone will, one day, be able to see this wonderful piece of history and engineering from the inside as well as the outside. You can also read about the history of the Champion Captain's Office, another structure owned by PM&S.